Harriet C. Isenberg is an Atlanta native who has been a member of the Georgia Bar since 1985. She is a licensed real estate broker and former Vice President and General Counsel for Globe Security Systems, Inc., one of the largest private security companies in existence at the time. Ms. Isenberg is a charter member and multi-term chair of the Creditor's Rights section of the State Bar of Georgia. 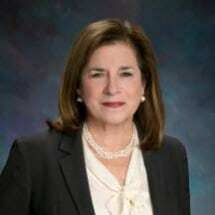 She is a member of the Commercial Law League of America, a director and president of the Apartment Vendors Association, and a member of the Construction Credit Group [of Atlanta]. She is a charter member of Georgia Creditors Council, which is a legislative action group concerning creditors rights. She is a frequent lecturer on the subject of creditor's rights and represented the prevailing party in the Georgia Court of Appeals in a case that established the law in Georgia regarding when attorneys fees may be awarded. Ms. Isenberg focuses her practice on matters of commercial collections.